The art style was absolutely wonderful in this game. Subtle, kind of minimalistic, but at the same time intriguing enough for me to motivate my imagination. I loved it, especially in the combination with the simple game design. Stunning work, I hope to see more games like that in the future. 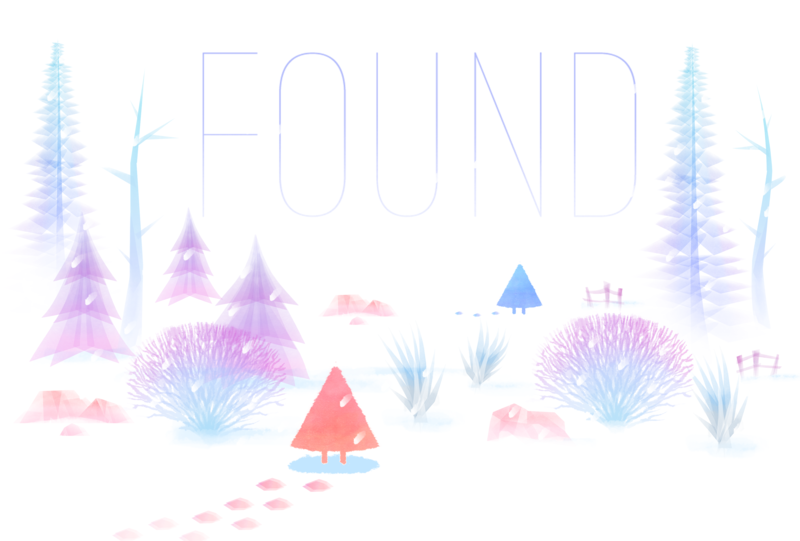 :) That's why I wrote a short article about "Found" and hey, who knows, maybe someone else wants to try it out themselves after watching our short gameplay video? I just can hope so. This is mint! I look forward to playing this with someone soon. Thankfully though I was able to find myself! I really enjoyed your game and especially the music! Is it possible to listen to it or download it somewhere? just couple ideas if you guys elaborate on this.. some wondering monsters in the forest would be fun to avoid. maybe when the main character actors are in danger the player can use stealth to avoid them. maybe player actor turns into a tree (which it sort of looks like). yeah the metal gear solid mechanic would work great ; ) maybe some of the wondering creatures could offer clues to help you find your friend or maybe some of them mislead and make you wonder into danger. would be cool if you could also look for foot prints to track down your friend. or if you have a level without snow then maybe player could use found objects to leave visual cues to the other player, etc.. and of course some kind of narrative to drive the relationship of the 2 main actors. would be interesting to utilize sound as a method of location as well. maybe one of the actors can whistle and the other player can hear what direction the sound is coming from. I... LOVE THIS GAME! The cutest graphics, the most wonderful game play, I could spend hours on this! I would rate it 100/10 if I could. Is this your first game? Thank you so much for the kind words! We're definitely talking about future ideas to flesh it out.